Carolina TarWheels: Conference Tournament Champs... Almost. You'll have to forgive the delayed update from last weekends conference tournament to the web. We weren't in quite the mood to rush home and put up scores and brag on how the weekend went. Although, the TarWheels are proud of how the team played and what all was learned throughout the weekend, you've probably gathered, the end result was just a touch short of sites that had been set. 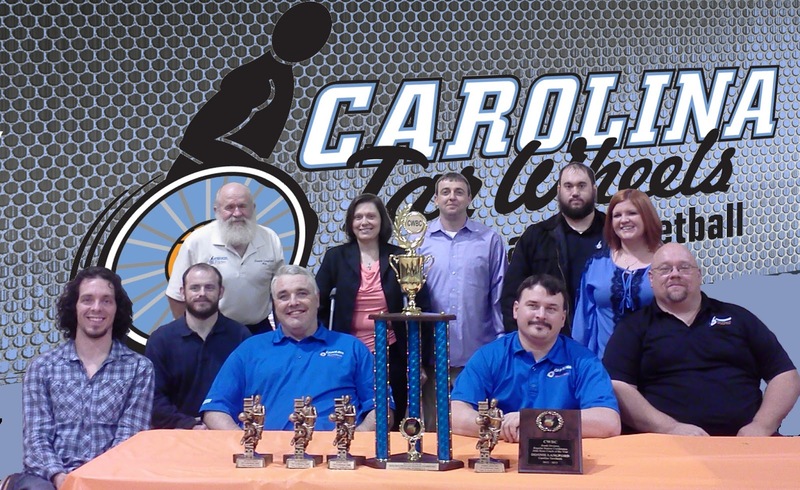 The Carolina Wheelchair Basketball Conference (CWBC) Tournament was hosted March 9th & 10th by the Port City Spokesmen in North Myrtle Beach, SC. The Concord based TarWheels came into the tournament ranked 1st and drew a bye for round one of competition. The remaining bracket play would end up putting the TarWheels in a not-so-familiar place, the losers bracket, where they'd be only one loss away from possibly being put out of the tournament. In game one for the team, the TarWheels took on the 10th seeded Tornadoes from Lumberton, NC. This was a great chance for even our brand new player, Ben Allsup, to get into the game! This worked well as a warm-up game. The TarWheels added to the "W" column for the year and turned their sites to The Georgia Hawks. Both being CWBC South team, the TarWheels and Hawks have seen each other four times already this year! The fifth would bring the same result, a win for the TarWheels! This game was well played by the Hawks and it is apparent the first year team will continue to grow and become more of a challenge down the road! Saturday night was a small intermission from the days games, including some fellowship among the ten CWBC teams. It's a tradition that a banquet be held and divvied out are awards for the previously voted on All-Conference Team players. Also top accolades are given to each side of the conference, the TarWheels were happy to take home quite a few of these! Congratulations especially to Coach Donnie Langford for receiving Coach of the Year! Any of the TarWheels will tell you that he is long over-due of this recognition! In addition, personal trophies for All Conference Team were given to Pete Morgan, Roger White, Richard Travis, and Donnie Langford! The big trophy was collected as well, that being for first place of regular season play in the CWBC South! Then... there was Sunday. Sunday morning the TarWheels would take on The Flyers in what would be the third meeting of the season. The previous games were back in November with the TarWheels coming away with two victories over the Flyers. This semi-final game would not go in favor of the TarWheels, loosing to the Flyers in an intense battle. Now in the losers bracket, the TarWheels would have to win for a chance at the CWBC title. The Hawks fought their way back for another chance against the TarWheels, but a worn out Georgia team was not quite the same match as they'd been for the TarWheels the day before. A chance still existed for the TarWheels to become conference champions as they now found themselves again going against the Flyers. The title game tipped off at 2:30 pm on Sunday. The TarWheels took an early 10-0 run, things were looking good, the team seemed to have found their stride! A smart time out was taken by the Flyers to slow the TarWheels' pace. From the point the ball went back into play, it sure seemed to the TarWheels as though the refs recognized a foul only when committed by the TarWheels. Langford received his 5th foul with still 9 minutes left to play in what was one of the most questionable calls of the day. Not to take from the Flyers, they played a great game, but unfortunately the calls being made started to affect the Concord team. As mentioned, many things were taken from the weekend, one of which is that the team will strive to put the refs out of mind while competing at the national tournament! The team, even minus Langford's deadly shot, remained in a tight battle with the Flyers. The scores drew even closer after he left the game, however a five point deficit was still present as the buzzer sounded. The TarWheels collected their second place trophy after the tournament was over. All Tournament Team awards were also given to Roger White and Donnie Langford. A home tournament is all that is left between now and the NWBA National Tournament for the TarWheels. Will this conference tournament disappointment be the extra push that the TarWheels need to bring their best to the national level? Time will tell!